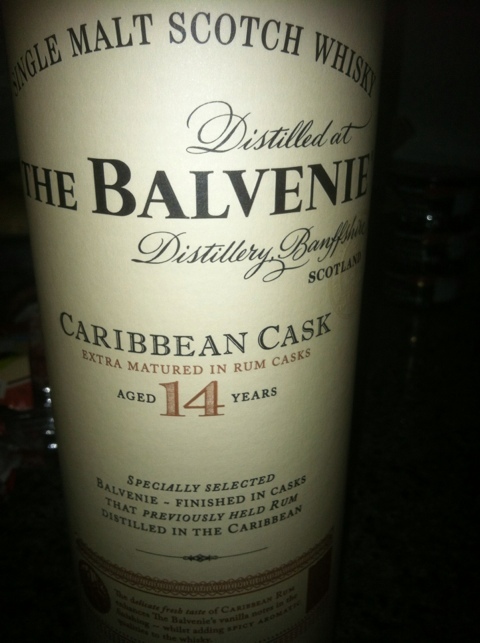 I make it no secret that I do appreciate Balvenie products and this 14 year aged Balvenie that was finished in Caribbean Rum casks is the perfect Christmas time scotch! The inspiration for this product is the 17 year Rum cask that came out a few years ago which was a one-time offering. This product which has been out for about a year, is evidently to be a regular offering for Balvenie. Like most of Balvenie’s regular offerings, the soft vanilla-honeyed notes are now joined with some spicy sweet ones from the previously used rum casks. The ABV rate is 43% and is easily enjoyed neat. If you are wondering what to get that scotch lover for Christmas, Hanukkah, (pick your holiday) then I feel very confident in suggesting this product. This would also be great as an aperitif! Totally agree! This Scotch is delicious. I washed down some Creme Brulee with a glass of this lovely whisky and the results were spectacular. I recommended this bottle to my brother in law as a birthday present for a mutual present. Apparently, the bottle didn’t last very long! Creme Brulee would be a perfect match! My bottle hasn’t lasted long either, like all my Balvenie purchases!